Click here to view our complete Product Site Map. Ready for the ultimate directional Wi-Fi setup? 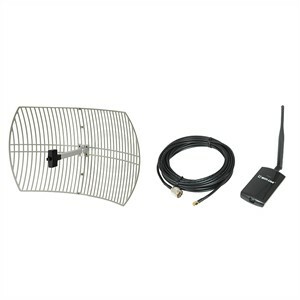 This kit combines an outdoor long-range 24dBi gain grid antenna with a compact high-powered 1,000mW wireless USB adapter. Use one of these to reach a distant or weak access point, or use two of them to create a point-to-point wireless setup exceeding 6 miles in distance! Kit includes almost everything you need to hook your computer to the grid; all you need is a pole to mount the antenna to. Kit contents: 1,000mW USB Wi-Fi adapter, 24dBi grid antenna, 5dBi dipole antenna, USB cable, 23-foot coax cable, lightning arrester, hardware for multiple mounting options and software on CD-ROM. Requires Microsoft Windows XP+, Mac OS 10.3+ or Linux kernel 2.6.13+. Operation may not be legal in all jurisdictions. For outdoor use only.